Very clean boat. 25 Ft…….9.6 Beam. Comes with fish finder, marine radio, am/fm cassette, fresh water washdown, bathroom with shower, sleeps 6, Loads of rooom. Great family or fishing boat. Nice Galley With sink, Stove And AC/DC Refrigerator. This boat is powered by a 7.4 mercruiser With a Bravo 2..
I/O that is fresh water cooled with under 300 Hours on it. 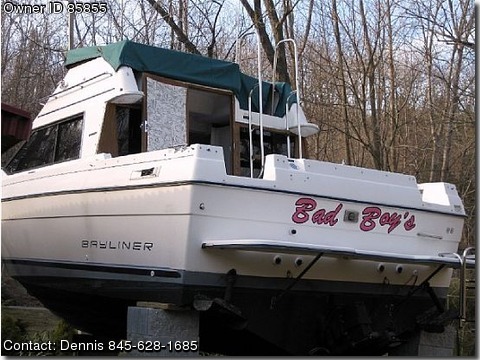 Has a bimini top on the flybridge and a full bridge cover…..Also a cockpit bimini cover……….LOT'S MORE …..MUST SEE…..Asking ….$17,000.00 …….Come take a look ……Let's Talk !!! !…………MAKE AN OFFER !!! !……….YOU NEVER KNOW !!! NOW $ 15,000.00 !! !………..JUST REDUCED AGAIN !!!!! 4/24/09………..NOW…….$ 13,500.00…….!!!! !